A crossover is the frequency where your speakers roll off and your subwoofer takes over. Given that no two speakers or subwoofers are identical, if you want perfect sound, you need DSPs to precisely tune this crossover point. Digital crossovers are one of the key core strengths of the miniDSP range of products. In this app note, we'll provide an overview of digital crossovers and how they differ from passive crossovers and other types of active crossover. With a high degree of flexibility, user-friendly interfaces, and unbeatable value, miniDSP digital crossovers offer the perfect solution for both the DIYer and the loudspeaker/system professional. So without further due, let's get started on how to build an audio crossover? The following diagram shows a typical system configuration, where volume control ( ) is done in the preamp and the passive crossover is located in the loudspeaker cabinet. The diagram shows a second-order two-way crossover, which has relatively gradual cutoff slopes on the woofer and tweeter — more components will be needed for steeper cutoff slopes. Also, more complex speakers, such as a three-way or four-way, will have a lot more components than shown here. As you can see, such passive crossover circuit is a combination of capacitors, resistors and inductors. 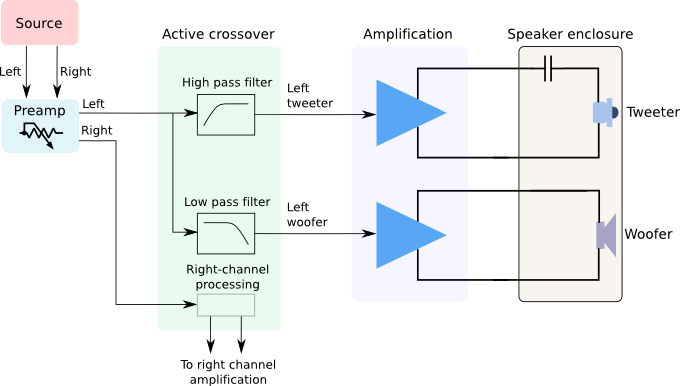 An active crossover, in contrast, divides the frequency band using the line-level signal and is typically positioned between a preamplifier and the power amplifiers. Each loudspeaker driver has its own dedicated channel of amplification, as shown in the diagram below. Connecting a driver directly to an amplifier channel improves damping factor and gives the amplifier greater "control" over the driver. (A capacitor is often used in series with the tweeter to protect it from possible low-frequency or DC transients, especially at turn-on or turn-off.) The large — often expensive — passive components between the amplifier channels and the speaker drivers are no longer needed. This advantage is even greater for three-way and 4-way speakers, as they need larger component values for lower crossover frequencies. Until recently, most active crossovers were implemented with analog circuitry, typically using op-amps to realize specific types of circuit topologies. Switches or plugin-modules select different crossover frequencies. 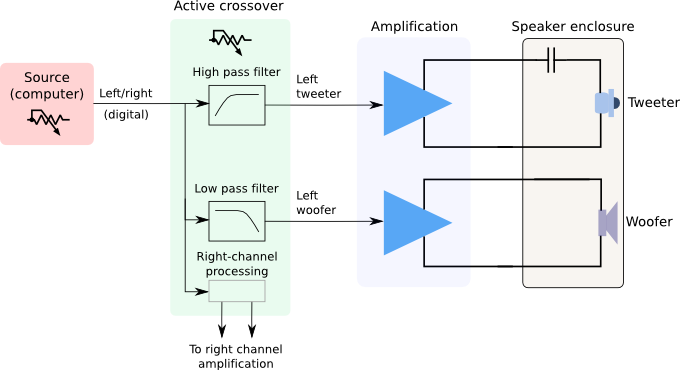 This type of active crossover is limited by the fact that each filter has to be realized with a physical circuit. For example, making the crossover slope steeper would require additional analog circuitry - not easy once a unit is in the field. 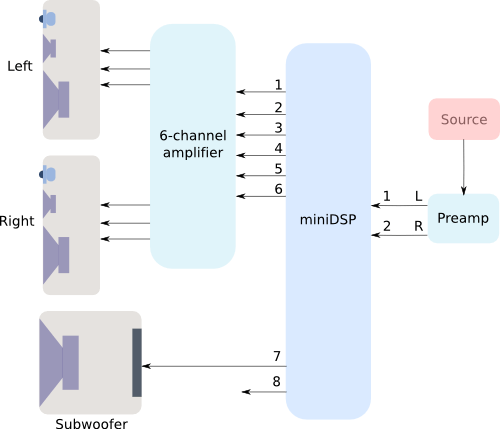 Digital crossovers from miniDSP incorporate many additional functions, enabled by flexible onboard DSP and our friendly user interfaces. We have also put together an extensive library of application notes to help you make the most of these features. Check out the below app notes to get started! Building a 2way crossover - basic tutorial on how to build a two-way active speaker. Stereo 3/4 way Crossover - basic tutorial on how to build a 3/4-way active speaker. Building a two-way active loudspeaker with the PWR-ICE125 - tutorial on how to build a complete 2-way active speaker with integrated crossover and amplification. PEQ vs Graphic EQ - basic explanation of parametric EQ and how it compares to a graphic EQ. Equalizing your home theater system with the nanoAVR and UMIK-1 - this app note shows the process for the nanoAVR, but it applies to any of our crossovers. Auto-EQ tuning with REW - how to use Room EQ Wizard (REW) to generate correction curves for your system and room. Advanced biquad programming. The miniDSP crossovers incorporate a feature that allows almost infinite flexibility and customizability of driver and system response. Linkwitz Transform - how to implement a Linkwitz transform to improve the low end response. Advanced Biquad programming - more about advanced biquad programming. Time delay/alignment. Time alignment on all output channels is essential to ensure smooth response through the crossover region. See the application note How to time-align speaker drivers. In addition to the active crossover itself, you will need loudspeaker boxes with drivers. You can either build a set from scratch, or convert an existing loudspeaker into an active speaker by removing the passive crossover. You will need sufficient channels of amplification: one per loudspeaker driver. You may even have enough stereo amplifiers available already. Otherwise, multi-channel amps intended for home theater applications will work well and are available at very reasonable prices, and if you have a DIY inclination then Class D power amplifier circuit boards with two, four, and even six channels are also available. Or, our PWR-ICE series of plate amplifiers might be a perfect match for your project. Finally, you will need to be willing to learn! Mastering active crossovers is an adventure, and we're delighted to be part of it. Please register and join in on our forum to join other like-minded folks building active speaker systems.